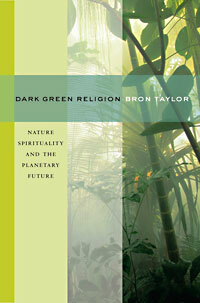 In Dark Green Religion (p. 192-94) I discussed the Welcome Ceremony at the United Nations World Summit on Sustainable Development in Johannesburg, South Africa, in 2002. This pageant was a remarkable example of dark green ritualizing within the international environmental milieu. Put simply, the performance tells the story of the emergence of life and of an harmonious, Edenic existence, eventually disrupted through greed and a callous indifference to Mother Earth. Yet, the performance also offered hope, as the nations were gathering to put things right, to learn again how to care for Mother Earth. At the corresponding "People's Earth Summit" near the official UN venue, I had a fascinating interview with two activists from the Kenya Greenbelt Movement. In the following interview excerpt, Nanga Tiango, an with the Movement, exemplifies, as I put it in the book, “the ways in which dark green religion is hybridized within the global environmentalist milieu” (p. 189). Both of the above videos are available on youtube by searching, respectively, for "Welcome Ceremony World Summit on Sustainable Development," or for "Nanga Tiango," or for Bron Taylor's videos. Par. 1, Al Gore’s exhortation to make environmental rescue “the central organizing principle of civilization” resonated with many in the global sustainability movement, and was also cited in Lawrence Buell, The Environmental Imagination: Thoreau, Nature Writing, and the Formation of American Culture (Belknap/Harvard University Press, 1996), 2. Gore also wrote, “We must all become partners in a bold effort to change the very foundation of our civilization.” Gore, Earth in the Balance, 14. The Goldman award program was created in 1990 and it is awarded annually to six or seven grassroots environmental activists from around the world. Award winners have included a number of activists who have become famous, including Lois Gibbs (1990), Wangari Maathai (in 1991, who in 2004 also won the Nobel Peace Prize), and Ken Saro-Wiwa (1995), who was executed the same year by the Nigerian (military) Government, which had alleged that this author and activist had incited the murder of four adversaries from his own ethnic group. The trial was widely viewed as unjust and his execution, with eight others, caused an international furor, including a campaign against the Shell Oil Company, which many believed were ultimately responsible. On Saro-Wiwa, see the Wikipedia entry at http://en.wikipedia.org/wiki/Ken_Saro-Wiwa. Par. 4, Statements made by Vandana Shiva that were quoted approvingly by David Suzuki included this animistic statement, “The Earth family has been not just all humans of diverse societies, but all beings. The mountains and rivers are beings too. In Hindi, the words Vasudhaiva Kutumbam mean ‘Earth family,’ the democracy of all life, all the little beings and the big ones with no hierarchy because you have no idea ecologically how things fit in the web of life” (232). Suzuki also praised her resistance to biotechnology (235), which most dark green thinkers and activists believe is desecrating. See David Suzuki,The Sacred Balance: Rediscovering Our Place in Nature (Vancouver, British Columbia: The Mountaineers, 1997). Shiva’s books include Maria Mies and Vandana Shiva, Ecofeminism (London: Zed, 1993), Vandana Shiva, Biopiracy the Plunder of Nature and Knowledge (Boston: South End Press, 1997), Vandana Shiva, Staying Alive: Women, Ecology, and Development(London: Zed, 1989), Vandana Shiva, Protect or Plunder? : Understanding Intellectual Property Rights (London & New York: Zed Books, 2001), Vandana Shiva, Water War: Privatization, Pollution and Profit (Cambridge, MA: South End Press, 2002). Par. 2, Aldous Huxley’s quote about the Philosophia Perennis, “the phrase was coined by Leibniz; but the thing – the metaphysic that recognizes a divine Reality substantial to the world of things and lives and minds; the psychology that finds in the soul something similar to, or even identical with, divine Reality; the ethic that places man’s final end in the knowledge of the immanent and transcendent Ground of all being – the thing is immemorial and universal. Rudiments of the Perennial Philosophy may be found among the traditional lore of primitive peoples in every region of the world, and in it fully developed forms it has a place in every one of the higher religions." See Aldous Huxley, The Perennial Philosophy (New York: Harper and Row, 1945), vii. Par. 3, for another book focused on sustainability, see Herbert Giradet, The Gaia Atlas of Cities: New Directions for Sustainable Urban Living (New York: Anchor, 1993). E.F. Schumacher’s widely reprinted "Buddhist Economics" article can be found (in its first printing) in Asia: A Handbook, ed. Guy Wint (New York: Praeger, 1966); and later in Resurgence 1, no. 11 (1968), Toward a Steady-State Economy, ed. Herman E. Daly (San Fransicso, California: W. H. Freeman, 1973), and Ernest Friedrich Schumacher, Small Is Beautiful: Economics as If People Mattered (New York: Harper and Row, 1973). As humans, we believed our highest purpose is to discover, live, and communicate what is needed to achieve the world functions for the benefit of all life. Our home is a water planet called Earth, cradled in a universe of beauty, mystery, and unfolding drama. We know that everything in the largest galaxy to the smallest particle is part of one unified, whole, interconnected system. . . .
Recognizing our common destiny, we envision a world in which love becomes the prevailing human function, cooperating together with all cultures, races, nations, and religions for the benefit of all life. We know that everything in the largest galaxy to the smallest particle is part of one unified, whole, interconnected system . . . Par. 1, many lesser-known groups were also present, promoting spiritualities of ecological interdependence (and social justice), such as the Temple of Understanding, see www.templeofunderstanding.org. Par. 2, “Soka Gakkai is a lay Buddhist organization founded in Japan in 1930 . . . and inspired by the teachings of Nichiren Buddhism. . . . The emergence of the Earth Charter was seen by SGI as a modern expression of the Buddhist teaching of the interconnectedness of all life,” which is why they have championed it. See David Chappell, "Soka Gakkai and the Earth Charter," in Encyclopedia of Religion and Nature. Rockfeller also told me that the despite Gorbachev’s effort the Roman Catholic church urged president of Costa Rica not to support the Charter. The president, nevertheless, made some of the strongest statements in its favor; see Steven C. Rockfeller and Earth Charter Steering Committee, "The Earth Charter at the Johannesburg Summit: A Report Prepared by the Earth Charter Steering Committee and International Secretariat," (2002). In this report Rockefeller documented seven other national leaders who spoke in its favor. Rockefeller also expressed frustration that the conservative Protestants and Catholics who were articulating the two criticisms mentioned in the Dark Green Religion text (p. 194), and putting them on the world wide web, refused to respond to his point by point responses, including his explanation that the capitalization of Earth was due to the recommendation of a scientist who explained a convention that a small “e” refers to dirt or soil and a capitalized Earth refers more to the biosphere as a whole. Par. 2, on dark green themes in the Johannesburg political declaration, Steven Rockfeller noted that Paragraph 6 of the Johannesburg Declaration,“expresses the spirit of global interdependence and inclusive ethical responsibility that underlies the vision in the Earth Charter. In earlier UN declarations and treaties, there are references to nature, the earth, and ecosystems, but in the Johannesburg Declaration one finds in paragraph six the first reference to the ‘community of life’ in a UN international law document” (Rockefeller and committee, 2). The report quoted here, dated November 2002, was accessed in May 2008. It was no longer online July 2008, after the Earth Charter USA website was revamped and moved to http://www.earthcharterus.org. Par. 2, for more on civil religion, see Edward Linenthal, Sacred Ground: Americans and Their Battlefields (Urbana & Chicago: University of Illinois Press, 1991), a study focusing on battlefields and memorials; for the way power is contested over places constructed as sacred, see David Chidester and David Linenthal, eds., American Sacred Space (Bloomington, Indiana: Indiana University Press, 1995). For empirical support for the thesis see Ronald C. Wimberley, "Testing the Civil Religion Hypothesis," Sociological Analysis 37 (1976). An excellent encyclopedia entry about civil religion, which provides additional important references, provided this important, further background: “The civil religious inquiry has also spawned a number of related concepts as more or less direct responses to civil religion. These include civic religion, diffused religion, and implicit religion, among others. In this context, the publication of the English translation of Thomas Luckmann’s book The Invisible Religion (Macmillan 1967) in the same year as Bellah’s essay is not an insignificant coincidence. Both works received considerable attention, and they provided fertile soil for the growth of an extensive conceptual apparatus for studying religion in contemporary society and culture. The two works also provide new frameworks for the classical sociological debate over public versus private religion.” William Swatos, "Civil Religion," in Encyclopedia of Religion and Society, ed. W. H. Swatos (Walnut Creek, California: Rowman & Littlefield/AltaMira, 1998). The ideologies of the modern nation-state assert ‘one place, one people,’ and proceed to homogenize diverse places and diverse peoples. The ‘nation building’ of modern states usually entails extinguishing or marginalizing the group identities of diverse people unfortunate enough to be caught within the internationally recognized borders of the state apparatus with ‘modern’ ambitions. In contrast, topophilic environmentalists assert the existence of place claims that are diverse and overlapping as well as distinct. [Deudney, "Global Village," 315.] Deudney also asserted, “Modern cosmopolitanism, the principle competitor and alternative to existing nationalism, is weak and relatively ineffectual as a source of political identity because is based on a [Cartesian] sense of space . . . incapable of evoking or sustaining a robust ‘here-feeling’ of place.” [Deudney, "Ground Identity," 130.] This is a key reason Deudney thinks earth religion is needed: secular understandings simply cannot inspire the feelings of belonging to nature that is needed to undergird the widespread transformations upon which the planetary future depends.